Apple Insider says that investment bank Piper Jaffray expects Apple to introduce networked tv, along with an Apple TV set-top DVR box later this year. Apple has consistently denied interest in such markets, however. Munster posits that a “connected television” device would further cement Apple’s position in the digital living room, by making available interactive TV, music, movie, and gaming features in one piece of hardware. Apple could also develop a television set that stands out from the competition, making use of its iTunes Music Store. “Apple could effectively replace the home entertainment system (including a music stereo, cable box, Blu-ray/DVD player, and gaming console) with an all-in-one Apple television,” Munster wrote. Apple could distinguish itself among TV makers with software that makes setup of complicated home entertainment devices as simple as using its existing Apple TV product. The analyst sees the company setting the stage for introducing these kind of new living room entertainment products, by year’s end, with a new version of its Apple TV set-top-box that will include DVR software for recording live television. Although Apple maintains that Apple TV is still one of its hobbies, rather than a core product, Munster estimates the company will sell 6.6 million of the devices during the current calendar year, up from an estimated 2.1 million units last year. The report, while founded in concrete knowledge of Apple earnings calls, DVR and TV patent filings, agreements with LCD manufacturer LG Electronics, and the large and growing customer base of iTUnes users and Apple TV owners, is largely an optimistic forecast “based on conjecture,” as Apple Insider puts it. His suggestions for more “sensible” additions to the next upgrade of Apple TV would include iTunes radio features, “alternative” content (like podcasts), HDTV mini-games, and more support for user-generated content. His idea to launch an Apple TV SDK, “a way for third parties to build modules that run on the device”, is especially tantalizing. 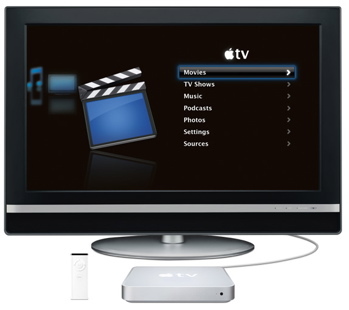 What do you think the advancements for the Apple TV (or other Apple television-content-consuming device?)? Will Apple TV remain a “hobby,” or will it step into the competitive TV fray? They’ve had two years to do something with it, and it’s still just Steve Job’s hobby. Now that he’s fighting serious health problems, Apple TV is a hobby that’s not going to get any attention. Other options have leap-frogged Apple TV – especially NetFlix’ on demand movie rentals and Boxee. Apple is about NOT NEEDING a DVR system because you bought the content through iTunes and can start and stop it when ever you want to already. I dismiss this as the bloviation of some really ignurt hack who is writing with having a clue. In fact, this is not journalism. Its not even writing, its just typing. In Digg this would get buried.